Treating damp in basement walls has been an essential part of utilising space in many Southsea homes for many years. Large sea-front properties are generally positioned just a few feet above sea-level and have large half-cellars, which have formed part of the living area since construction way back in the 1860’s. Of course most of the 4 storey houses, running between Osborne Road and Kent Road in Portsmouth have long since been turned into large modern flats. PermaFix were contacted by a purchaser of one of the semi-basement flats, who needed to have the walls treated for damp. 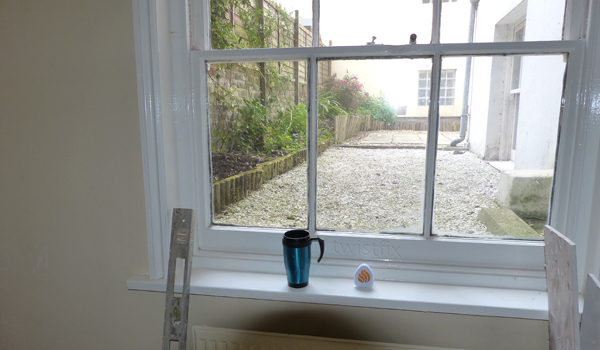 One of our surveyors called to assess the level of dampness in the flat and to establish its cause. Our inspection notes recorded that the building was an early example of a cavity walled structure above ground; the cavity being in-filled at basement level. The internal floor level of the basement is approximately 1m below the external ground level; hence the term ‘semi basement’. Many of the walls showed no signs of dampness and it transpired that these walls had previously been effectively treated by a reputable damp proof contractor that works nationwide. Surprisingly however several walls had not previously treated and these walls were damp up to various heights. When treating damp in basement walls it is important to understand that a portion of the property’s walls are buried below outside ground level and that dampness from the surrounding soil is absorbed into the walls. It is also vital to realise the difference between damp proofing cellars and waterproofing them; treating damp prevents dampness form being absorbed into the living area of the property whilst waterproofing requires a design that protects against water ingress. For this Southsea project the householder was clear that the basement flat was to be treated for penetrating and rising damp rather that to have a full waterproofing system installed with pumps and sumps that are designed to dispel flood water. PermaFix operatives, removed all damp and salt affected plaster from the walls and injected a chemical damp proof course above outside ground level to combat rising damp. To protect the lower sections of the internal walls the operatives introduce a tanking system that included a physical moisture barrier in the form of a mesh-faced membrane, in line with that which had been used during the previous basement damp-proofing works. Our plastering team promptly renewed the plaster, allowing the owner to move into the Southsea basement flat in the knowledge that works for treating damp walls are complete.